(Newser) – The tallest building in Western Europe is currently London's Shard—but that won't last if a tiny Danish town gets its way, the Smithsonian reports. Brande, population 7,000, has approved a 1,049-foot building for 30 retail stores, educational spaces, hotel rooms, and offices for a clothing company whose wealthy boss conceived the project. "The overall building project is thought as an investment in Brande, and the planned high-rise building will function as an icon for the new expansion," says Anders Holch Povlsen, owner of Bestseller clothing, in a press release. The so-called Town and Village project was approved in March and could begin rising this year, per the Washington Post. 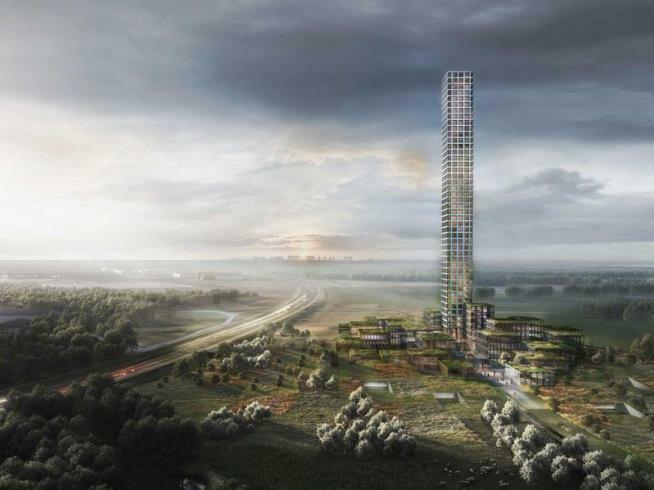 Not that all Danes are pining for an Eiffel Tower-size skyscraper in a little town. One day it will be Denmark's tallest windmill. Why build something that tall in a small town? It is a colossal waste of money.